Sprinkle chicken tenders with house seasoning. Dredge chicken in flour, dip into buttermilk and back into flour. Preheat oil to 350 degrees. Fry fingers in deep hot oil 5 to 7 minutes or until golden brown. 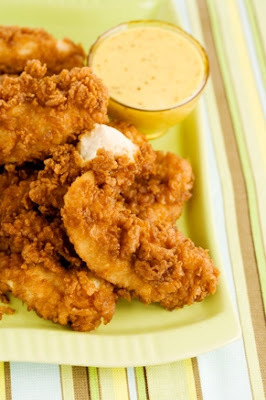 Serve with honey mustard for dipping. Combine all ingredients together except the orange juice and stir well. Thin to pouring with orange juice. Store in refrigerator.